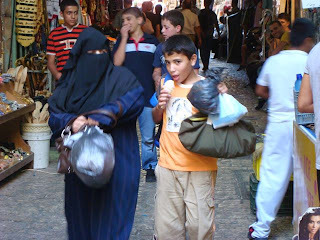 This is round two of the pictures I found to be noteworthy on my trip last week through the Muslim and Christian Quarters of Old City, Jerusalem. 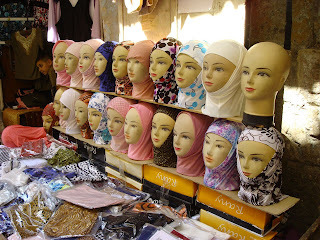 I decided to break them down into categories, really, and this post's focus is on the traditional headcovering of Arab women - the hijab, and in one case the niqab. Poster advertisement for yet another hijab and niqab store. frame that had on the gear. Too bad they're overexposed. 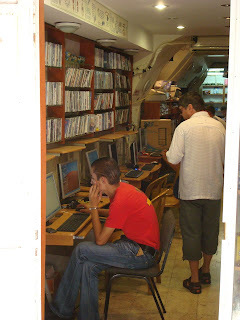 computers and the Internet symbolize the evil devils of the West. haha Marissa that's such a good point. 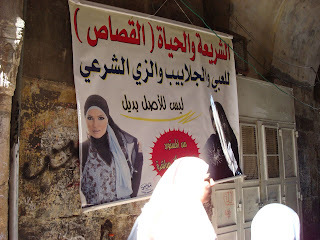 Any Arabic readers know what that poster is an ad for? It was directly across from a headcovering store! I am totally against the Israeli government allowing people to be out in public with birkas on. Anyone can be under that covering/ strapped with bombs! "I am totally against the Israeli government allowing people to be out in public with birkas on." That is actually something of a good point. On the one hand, however, Israel is a democracy with religious freedoms for all. Adherents to faiths that call for full body coverings are allowed to practice their faith through their dress. On the other hand, Israel is plagued by terrorism. So, it would be quite possible for a country in Israel's position to ban certain modes of dress during "states of emergency." However, Israel would NEVER do such a thing, which even I as a fairly right-leaning person abhors. France banned headcoverings in public places, so it's not some far away concept to imagine. It's just that Israel is so liberal, so progressive, so committed to religious freedom that we would never, even at the grip of terrorism, stop religious Muslim women from wearing burqas. Quite the subject, though. It's not so cut and dry. I am totally against what the other anonymous poster said. I think you're just being xenophobic, and it's that type of illogical thought that causes more friction between communities. Security IS paramount, but guess what? If anywhere near the majority, or even a significant amount, of bombings were caused by people who wore burqas, they would've been banned a LONG time ago. The fact is, you could strap a bomb or whatever under pretty much ANY type of clothing. Also, I forgot to thank you, Danny, for the awesome pictures. Great job!